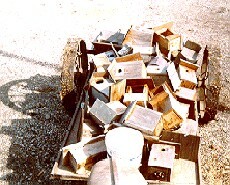 This is a cart load of birdhouses that I put out around the place each year. I have all the different size access holes for specific types of birds. One thing I think you must do to give the native birds a chance is to aggressively go after the English Sparrow (house sparrow) and the European Starling. If you aren't willing to eliminate these competitors and the nests they build in birdhouses that we provide for our native birds, then in my opinion, you at least shouldn't provide a home for these pests. Check out Cornell Lab. of Ornithology for interesting facts about birds. 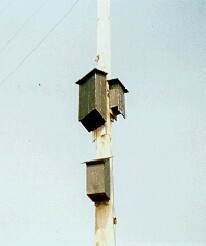 In the spring of 1993 I built 3 different styles of Bathouses and set them on this pole. We have had individual bats roosting in buildings but have never had a colony. 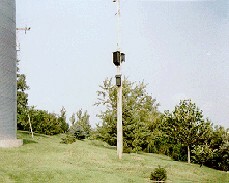 I am hoping to get both Little Brown & Big Brown Bats, which are native to this area. I have seen a Hoary bat the last several years, which is a solitary bat that roosts in the conifers. Jim Buzbee has all the links and information you'll ever need on bats!